Conrad, I accept the trust and the charge that you and the Board of Directors have given to me, and I do so with humility and with joy. A college that was built in something of the manner of a barn-raising, with the president laying planks across a muddy plot of farm land to welcome the first class. A college for mainly rural, Mennonite students from families with little or no experience of college education. A college where literary societies quickly became the rage, staging spirited competitions that drew nearly every member of the campus community as well as local citizens to their every Friday evening debates. 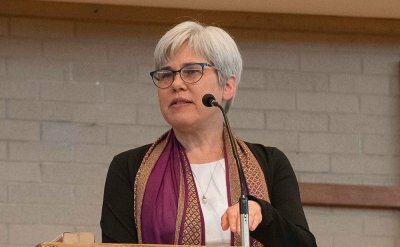 Today we honor those founding men and women, who pressed their vision and energy as cultural and academic entrepreneurs — pressing sometimes within and sometimes against the social boundaries of the Mennonite church as it moved from the 19th into the 20th century. Today, we face an historic degree of tension and social pressure in higher education, reflected in a tangled debate about the worth of a college degree, the appropriate role of debt in obtaining that degree, and concerns that college degree attainment in the U.S. is stagnant overall and inequitable by race and income level. This, in the face of research showing that a college degree is also strongly and positively associated with people’s lifetime earnings and sense of thriving and well-being. If we at Goshen are to navigate and illuminate a way through this turbulence, our particular light must shine even more brightly. If we are to persevere and indeed flourish for another 125 years, we must be clear and confident about what we offer the world. Such an education, I propose, will have certain distinctive and defining qualities. These qualities are not new to us, but are re-affirmations of who we have been. I offer you today four affirmations, which I believe are distinctively Goshen, and which yet need to be renewed for this new time. I affirm that a Goshen education will continue to express and to integrate the transcendent values of beauty, truth, and goodness. We offer an education that liberates through engaging the whole person; it awakens and enlarges the capabilities of our students through the integration of the arts, the sciences, the humanities, and the application of knowledge to do good. Thirty-five years later, I can say with confidence that the Goshen Core curriculum is outstanding in its integrative nature. No curriculum is perfect or immutable; but what this faculty has made is exceptionally creative, interdisciplinary, and integrative. My second affirmation is that a Goshen education will be one in which the faculty are outstanding scholars engaged in the pursuit of truth. They are scholars in their disciplines and they are scholars of teaching and learning. I am here, in part, because of my deep respect for this faculty, and because I am determined to support them. And so I say to our faculty: Today you are behind me on this stage. But every day I am your president, I will be behind you. And thus our work happens in a truth-seeking community. Parker Palmer, considered one of the most influential leaders in education, describes truth as “an eternal conversation about things that matter, conducted with passion and discipline. . . .” The academic disciplines, ideally, teach us sets of practices and standards for making inferences and holding conversations about truth. At its best, our truth-seeking community includes many diversities of experience, intelligence, identity, and academic discipline, and advances our knowledge through creative conflict, not competition. When our teaching is relevant to our lives and our students’ lives, when it involves controversial ideas or challenging methods, conflict arises. Let us embrace relevance, controversy and challenge! Let us practice how to listen deeply, to be curious about our differences and to create a conversational space when it is uncomfortable — even distressing. Let us manifest our respect for the intrinsic worth of every member of our campus community, and also our freedom to ask challenging questions and speak opposing views. Third, I affirm that a Goshen education will continue to be experiential and transformative to an unusual and adventuresome degree. Our education combines acquired knowledge and direct experience. Study leads to experience and experience leads to study. Whether in a classroom or community or lab or oratory or stage, experiential learning challenges you to “try this!” Then you will know something to be true or false for yourself. Goshen College students “try this” when restoring prairies on our campus and measuring the return of species of plants and pollinators. When learning not only French or Spanish, but also Wolof or Quechua as they build relationships with host families in Senegal and Peru. When learning as students within a local prison classroom as ‘outsiders,’ alongside the ‘insider’ incarcerated students. When learning to see how racism hangs on, within our society, and yes — within our campus — and when practicing skills to dismantle this and other forms of oppression. Throughout our history, Goshen scholars have written a great deal about transformative education — which I stand behind. I also want to hold this over-used term to its true and high standard. It does not come cheap. It invites and sometimes forces the learner to go to a new place because the old place is not working anymore. Goshen challenges learners to let many “prior things” fall apart — received world views or biases or privilege that stand in the way of our becoming the people we long to be, and to bring about the world we want to live in. Looking back on my own experience at Goshen I can see how my own transformations that happened here have affected my life and my career. On my Study-Service Term in Haiti, I learned that living simply and vulnerably as a cultural outsider brought about moments of deep connection and happiness. My prior idea that wealth and power were the keys to joy and beauty fell apart. As a woman, my experiences and relationships here taught me that being female did not make me less scientific or less able to be a leader. My prior ideas about my own capabilities fell apart. These “prior things” did not go down without a struggle. Transformation is not tidy. The process of old ideas falling apart is disruptive and chaotic. It usually includes a disconcerting reorientation. This is where friends, mentors, teachers, and one’s own intelligent, shining soul become essential ingredients. Being unusually accustomed to transformative learning, our students, staff and faculty, at their best, possess qualities of patient, wise warm-heartedness in our moments of transformative growth. I affirm that we are rooted in an educated conscious love, formed and transformed by the way of Jesus. A love that gives us courage to be vulnerable and to be fierce when called upon to act for goodness. At a time in our nation when social inequalities are increasing, we will strive to craft policies and choose actions that expand social opportunity and increase equity. At a time when the rhetoric of higher education pits job preparation against holistic human development, our education will be holistic and prepare our graduates for great careers. At a time when the arts and humanities are viewed as non-profitable, we will preserve them, because they enable us to make a world that is worth living in. I stand on the shoulders of past leaders, some no longer with us and some here today. Thank you, presidents Brenneman, Showalter and the first President Stoltzfus, my father. Thank you interim presidents Newbold, Yordy, and Weaver. Thank you all for your work in leading this institution. And thank you to the friends, alumni, faculty, staff and students whose devotion to Goshen has cultivated and sustained this distinctive college for more than 124 years. But our work is never complete. As I look ahead, I want not only to build on our current distinctions, but to imagine a vibrant future as well. I imagine a future where we openly engage with and invest in this Maple City of Goshen, this Elkhart County and this region of Michiana — a future in which we see our commitment to local place and land and people as a part of our distinctive strength, a wellspring of learning and relevance. This city claims as its motto that we are ‘uncommonly great at the common good.’ It is our very good fortune to be a part of this common good. I imagine us growing in our knowledge and relationship to the Potawatomi and Miami people who originally inhabited the lands of Goshen College. 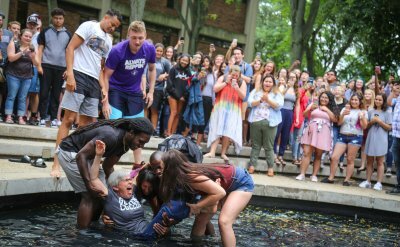 I imagine our campus culture being transformed by the full participation of the increasingly diverse student body who are choosing a Goshen College education. I imagine a Goshen College transformed by that new reality; willing to let “prior things fall apart” when our transformation requires it. And to create new things together. Most of all, I imagine the joy of working with this community to create shared vision and new aspirations as we continue to offer a distinctive and excellent Goshen College experience for life, leadership and service. 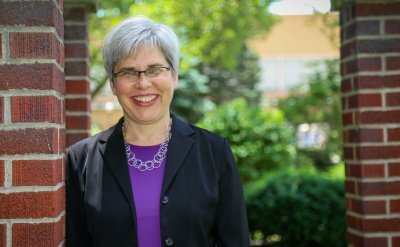 I am deeply honored to accept the role of president of Goshen College. I accept your charge with deep humility, because the trust you are extending is so great. No one is wholly adequate for this task, and I will need your patience and companionship as we learn together the work that lies before us and the decisions that we will be called to make. I accept your charge with deep gladness, and I will serve you with my whole heart and being. May we be strengthened in our inner beings with power through the Spirit, and may Christ dwell in our hearts through faith as we go forward, rooted and grounded in love.